Francis Douglas Aylett was the son of a Metropolitan police inspector, and arrived in the Chelmsford area in the 1900s. He joined the army, and was killed near Ypres in October 1917. His family home was in Swiss Avenue. Francis is commemorated on the Civic Centre Memorial, Chelmsford and by the Chelmsford Parish Great War Memorial in Chelmsford Cathedral. Crockett Aylett (born on 27th December 1890 in Pimlico, baptised on 8th April 1891 at St. James’ Church Enfield Highway and died in 1980), Leonard Charles Arthur Aylett (born on 10th January 1893 in Kennington, London, baptised on 27th April 1893 at St Philip’s, Lambeth, London and died in 1942), Dorothy Elizabeth Aylett (born on 5th September 1894 in Chiswick, London, baptised on 8th September 1897 St. Stephen’s Church in Tredegar Road, Bow and died in 1972), Edgar Cyril Aylett (born on 31st January 1896 in Chiswick and baptised on 8th September 1897 St. Stephen’s Church in Tredegar Road, Bow and died 1958), and Bernard Nicholls Aylett (born on 3rd November 1899 in Bow, and died in 1996). The 1901 census recorded three year-old Francis living with his parents and seven siblings at 8 Vernon Road in Bow. His father was a police inspector and his brother Clarence an office messenger. By the next census in 1911 Francis’ father had retired from the Police. Initially he had lived in Danbury, then became postmaster at Woodham Mortimer, before moving to Springfield late in 1909. The 1911 census found 13 year-old Francis living with his parents and five siblings at 11 Queen’s Road in Springfield. Francis’ father was described as a police pensioner; his brother Robert was a clerk at Essex County Council; brothers Leonard and Cyril, instrument makers at Marconi’s; and sister Dorothy, a milliner’s apprentice. Francis’ father had joined the Metropolitan Police in 1878 and was initially stationed at Upper Street in Islington, later serving on special duty for the War Department at the Royal Small Arms Factory at Enfield Lock and the Gunpowder Factory at Waltham Abbey. He later served in Westminster and was awarded Royal medals for services at Queen Victoria’s Diamond Jubilee, King Edward’s Coronation, and King George’s Coronation. In 1913 Francis’ father was appointed mace-bearer for Chelmsford Borough Council. 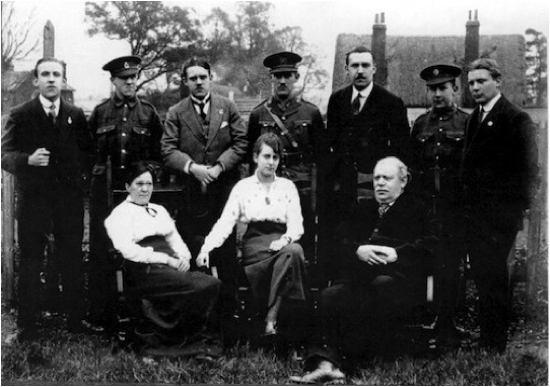 The entire family is pictured (right) in a photograph taken in Chelmsford during the First World War. We know that the central brother is Ernest Aylett, but we do not know for certain who the others are and, in particular. which one is Francis. An analysis of their appearance compared to records of military service suggests that left to right they are: 1. Leonard Charles Arthur, 2. Edgar Cyril, 3. Francis Douglas, 4. Ernest Robert Crockettl, 5. Thomas William Clarence, 6. Bernard Nicholls, and 7. John Percy George. Francis lived and enlisted at Chelmsford. He served as Private 330750 and 9759 in the Cambridgeshire Regiment and later joined the 1st Battalion of the Royal Fusiliers, a regular army battalion that was attached to 17th Brigade in the 6th Division and was stationed in Ireland at the start of the war. The battalion landed in France in September 1914. Francis was killed in action on 4th October 1917 while serving as Private 228121. Today he lies at Hooge Crater Cemetery, four kilometres east of Ypres in Belgium (grave: VIA. J. 15). He was entitled to the British War Medal and Victory Medal. He was born in Bow, London on 3rd February 1898, the son of Thomas Aylett and Emma Aylett (nee Crockett). His father had been born in 1860 in Woodham Mortimer; his mother in 1864 in Enfield, Middlesex. His parents had married in 1884 in London. Francis was christened at St. Stephen’s Church in Tredegar Road, Bow on 29th November 1899. At the time his father was a Police Inspector living at 8 Vernon Road in Bow. Francis’ youngest brother Bernard was christened the same day. His brother Serjeant (Acting Captain) 14611 Ernest Aylett won the Military Cross while serving with the 1st Battalion of the Northamptonshire Regiment. Eldest brother, Thomas served as a Chief Inspector with the Metropolitan Police, while brother John was a commercial accountant. 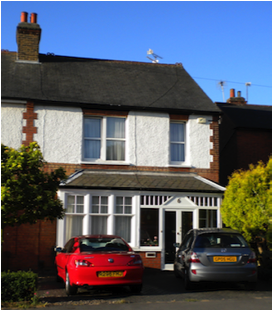 Francis’ parents were listed by the 1918 register of electors at 6 Swiss Avenue, Chelmsford (pictured). His mother died in 1933 when living in Ilford. His father is thought to have died in 1924 in Portsmouth. Francis’ brother Leonard died in 1942, aged 49, while serving as Electrical Artificer 1st Class D/M 31076 at H.M.S. Vernon. He is commemorated by the Commonwealth War Graves Commission and is buried at Hasler Royal Navy Cemetery in Hampshire.